Ink Pal is our very own Referral Program designed to give you the opportunity to build a new income source. It is completely automated which means this is a REAL opportunity for you to build a PASSIVE income. You don’t have to work for it! Our system does it all for you. When you become an Ink Pal, we will send you an email with your username and password that will give you access to the Partner Centre. Inside we have created some cool tools that do all the work for you. The first is the Ink Wealth Referral Standard link. You simply copy and paste the link URL and send it to the people you want to help. This can be anyone who you think may benefit from our services and can be sent via email, text, word document or any other method you can share a URL with. We have also created the Ink Wealth Referral Banner for your Word Press site. You or your web site provider can copy and paste this code into any Word Press page and our banner will appear with your personal link attached to it. Your referrals can simply click through this portal straight from your site. When your referral clicks your Link or Banner they will be directed straight to our referral sign in page. This is a simple form they fill out. When they do, they are immediately tagged as your referral and as such are given a priority status. We then contact them and help them in any way we can. When their loan is settled, our system generates the commission payment earned by you and we process the payment. We will email you a notification that you will receive an Ink Pal Commission. 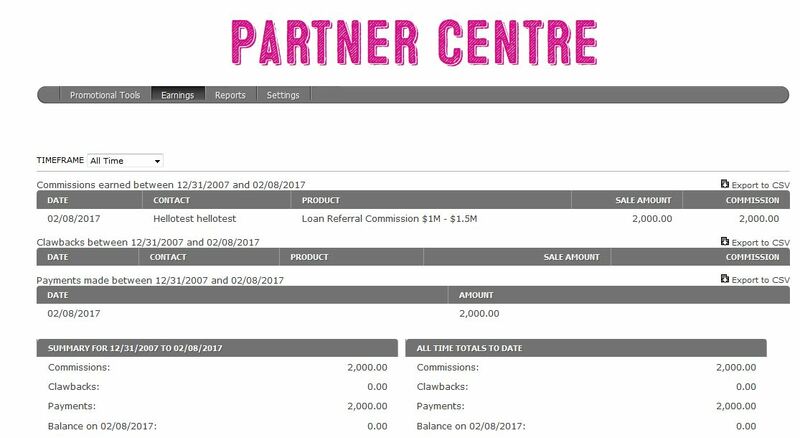 We have also provided an Earnings tab in the Partner Centre, so you can keep track of all your commissions as you grow. If you want to track individual referrals for reporting purposes, you can use our tracking facility in the Reports tab..
And, if you wish to change your password, you can in the Settings tab. For easy access to the Partner Centre we have provided an Ink Pal log in tab on our home page. All this works to build you another income, whilst you are busy doing whatever it is you want to do.